We open with kids plotting evil (what I assume kids are doing all the time) and a nasty monster apparently sucking ghosty stuff from one of them. Soul? Life Essence? The vital spark of evil that powers all small sticky creatures? (I’ve had to deal with my cousin’s kids, there will be vengeance snark). Ichabod is duly outraged. Abbie’s expression says it all. She also pokes him about all the texts he’s sharing with historical society lady Zoe – he meanly pokes back about her still not telling Jenny about finding their dad. She’s not happy to rock the boat, her dad has a whole over life and why distract her and Jenny’s life to chase after a man who may not care? To the plot! Joe Corbin (the sheriff’s kid, an EMT) calls her about the little girl who was all monsterised and is now in a coma (a quiet child! – Victory!). Pandora is also in the hospital being all ominous. A trip to the hospital only allows Jenny to reassure the surviving kid since she remembers being a kid who no-one believed when she talked about monsters. Abbie also has to make a quick call to Reynolds about why she’s involved in a non-FBI case (I wonder how often this will be a thing and whether he will be brought into the loop). Abbie gently tries to explore Jenny’s opinions about their father while being nostalgic and it’s clear Jenny rarely thinks about him – and when she does it’s not to think nice things. Ichabod is terrible with children. We will never speak of this scene again. She does claim that it was the toothfairy who put her sister in a coma. Ichabod has a long memory of the tooth fairy which, of course, involves Betsy Ross. Kids were getting sick and Ichabod wanted to comfort her but she turned to Paul Revere who was a dentist (and he fought against the woo-woo as well) – since all the kids who went into a coma had recently lost a tooth. Research reveals an Assyrian demon called and an Abyzou that eats souls through open wounds and collects teeth – and is weakened by silver, leading to the habit of giving silver coins to children who lost teeth. He Abyzou is also invisible except to children. And Joe warns Ichabod that Abbie and Jenny constantly like to set people up and pokes Ichabod about Zoe texting him every 2 seconds. Abbie finally tells Jenny that she knows where their dad is – and Jenny says she knew for 5 years. That kind of vexes Abbie since she’s been feeling super guilty for not sharing after a few days. Jenny assumed Abbie hated him – while Abbie assumed Jenny died but Jenny points out she only parrots what Abbie told her because she was 3 when their dad left, she doesn’t remember. The Abyzou attacks the kid who wards it off with the coin then Jenny swings ineffectively at the invisible thing. Only hitting the sprinkler – but getting it wet allows them to see it. 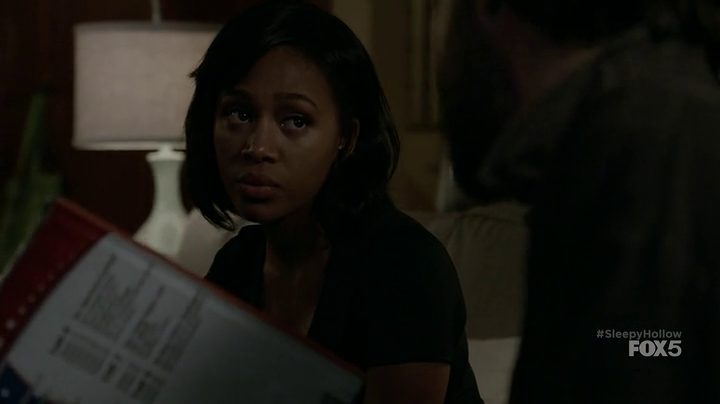 But not win – Abbie is injured and ends up in hospital where Ichabod and Jenny desperately worry about her. Jenny also has an awesome sister-reassurance speech for Saffron over her comatose little sister. While Pandora is there to make it all worse and full of despair. She also promises to be able to save her sister. With a little bag. Pandora also drops in to see Abbie, waking her from unconsciousness. She talks about her abusive childhood and feeding her father to a lion. Jenny and Ichabod looks at Paul Revere’s bag of tricks and between them they come up with the tools to kill the demon. With silver nitrate they reveal the creature, but rather foolishly do so outside so it can run away and hide until it wears off, but it comes back, they re-reveal it and Jenny gives it a good stabbing. The kid wakes from her coma. Another flashback to Betsy and Ichabod kissing – this a drug induced hallucination when under a dentist’s drugs. He’s very very zonked. And Abbie checks all his flirty texts. Jenny has also succeeded in tracking down the woman who wanted to steal the shards – and they make up over their dad. Abyzou an Assyrian demon – looks like another example of drawing on random woo-woo from other cultures for monster of the week – but from what I can tell an Abyzou isn’t particularly Assyrian (nor particularly aimed at children, or teeth). It’s just a random demon name. (I don’t even think it’s necessarily a KIND of demon so much as the name of one). And if Pandora is Sumerian, a middle eastern actress would have been nice. I get it, we’re inserting Betsy as a character – but it feels slightly ridiculous that Ichabod now can’t recount any history or memories without Betsy in it somewhere when he never mentioned her once in the last 2 seasons. It’s clumsy, very clumsy. That said, I do appreciate they’re not turning her into Katrina the second.